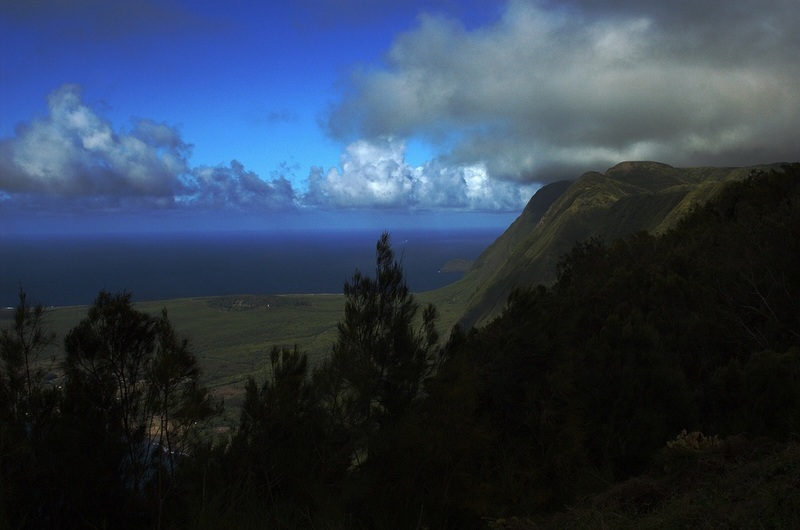 The sea cliffs of Molokai rise dramatically over the Kalaupapa Peninsula. Whenever I visit the northern side of many of the islands it is common to see this kind of atmospheric effect. The trade winds bring in the nebulous clean clouds that float above the blue pacific. The air is super crisp as one realizes that there hasn't been one molecule of human induced interference for thousands of miles. It is a feeling of absolute isolation coupled with incredible beauty. The sea cliffs on the right are some of the highest in the world, measuring over 2000 feet.